"Absolutely perfect for the exciting new Panasonic DC-GH-5S and Black Magic's revolutionary new Pocket Cinema Camera 4K with an MFT mount!" Because only Selling Out Soon is authorised to sell this official Australian Voigtlander stock online, you're getting the real Voigtlander product here. Be absolutely sure of the true Voigtlander experience and that you're getting what you pay for. Because Selling Out Soon only provides genuine Aussie stock. 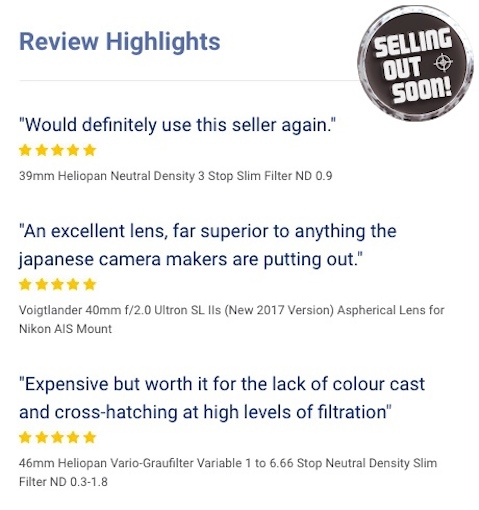 You'll also have the peace of mind of TRIPLE the standard Voigtlander warranty, only from Selling Out Soon, so in the odd event of any technical or fault issues, you'll receive first class help immediately - here in Sydney, not overseas! "The Nokton 17.5mm F0.95 Aspherical is an ultra-fast manual focus lens for Micro Four Thirds cameras that offers a moderately wide angle of view equivalent to 35mm on full frame. The aperture is controlled by a ring on the lens that can be set to rotate steplessly without any click-stops, which is useful for videography. A 10-bladed aperture diaphragm is used for smooth background blur." Voigtlander 17.5mm f0.95 Nokton MFT Lens - Integrated MFT Mount & Selective Aperture Control. Please note: Official Voigtlander products are available for sale to Australia only, and Selling Out Soon is the official online-only dealer. EXTENDED AUSTRALIAN OFFICIAL WARRANTY (Triple standard, 3 Years) Because only Selling Out Soon is authorised to sell this official Australian Voigtlander stock online, you're getting the real Voigtlander product here. Be absolutely sure of the true Voigtlander experience and that you're getting what you pay for. Because Selling Out Soon only provides genuine Aussie Voigtlander stock. 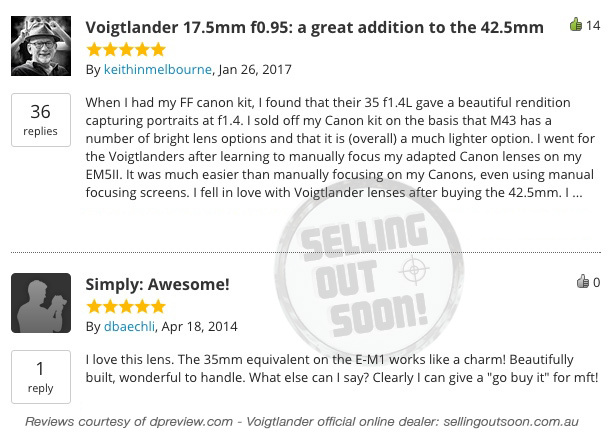 You'll also have the peace of mind of TRIPLE the standard Voigtlander warranty, only from Selling Out Soon, so in the odd event of any technical or fault issues, you'll receive first class help immediately - here in Sydney, not overseas.